I love kids. I love dogs. But I don't think kids should be allowed to do things that dogs can do, like pee in public. I've had some interesting encounters with children this month. First, some mom let her toddler walk around CVS with only underwear on...and everyone (except me) thought it was the cutest thing since bashful puppies and kitties that say I Love You. Who does that? Second, an older child was waiting behind me in the Jamba Juice line at the mall and tapped my shoulder to ask if I would let her go in front of me. Who does that? She was too old to play the "I'm super cute and adorable" card. Then, while walking to Sephora in a different mall, some random child lunged in front of me and hugged me--a complete stranger. Her mom just kept chatting with the kiosk lady. Who. Does. That? Anyway, on to the clothes. Don't be alarmed. The orange is a part of the petal scallop shorts and not underwear. But yes, those are cartoon robots on my sweater. It's not quite sweater weather just yet here in the bay, but it's getting there. I was a bit taken aback by how chilly it was this past weekend, but no worries because these cute, little robots and comfy cutout booties kept me warm. 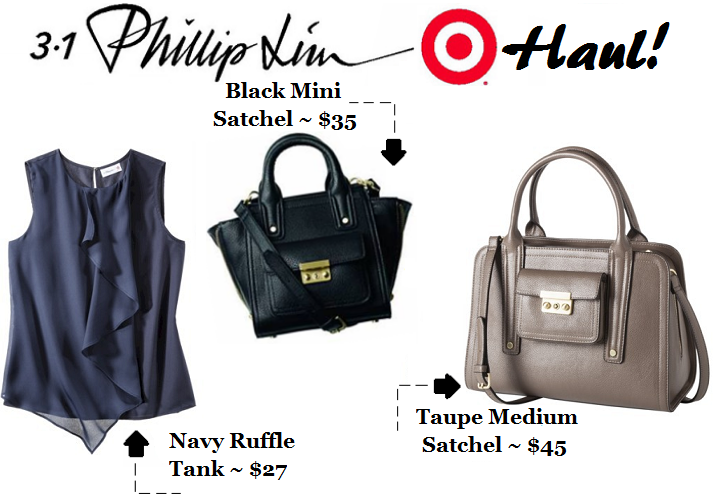 By the way, this is what I scored from the Phillip Lim for Target collaboration on Sunday. My main objective was to grab the bags that I loved so I'm very happy with the outcome. I was the first in a line of about 20 people, there was no running, and people were nice. I even had 6 bags in my cart and then gave 3 away and even saw some people do a trade. Also, I bought the black tote bag with gusset (the one that is reminiscent of Lim's $900 Pashli), but I'm not sure I'll keep it. Kids are so unpredictable and I think some of their unexplained behavior has a lot to do with what they see in things like cartoons and on tv. Love this adorably printed sweater, its the cutest thing! Wishing you a great start to the week doll! I'm in the process of choosing buckled booties for this autumn and yours look stunning! Yes, I know, I had some "interesting" encounters with kids too. I think their parents need to be more attentive and careful with them. Wow, you have had some strange interactions with kids. Super weird! I love that sweater - that print is beyond cute. And LOL on your kiddie encounters....I can't even. I mean, who lets their kids go out in underwear in a drugstore?!?! totally! i love those boots so much! It is chilly these days! Glad the robots doing their job :). As for those kid encounters, WTH! I would never let my kids walk around in just underwear. Ew. Not cute. And the line jumping kid is rude. Hopefully never my child. And the random hug is creepy. I make sure my kid touches no one out in public. I totally adore your cut out boots, You look hot babes. I would never let my child out in public with underwear. That's crazy! I've had a child hug me, a bit strange. Like, OK. Love what you got from the Philip Lim Collection. It's nice to see people getting along. They were even nice to each other online. I didn't want anything but I was up monitoring the online part. And you are so right about the kids... Who is in charge of these brats?!? Oh bless your soul , I am with you on the "who does that", I had a kid pee very close to my feet last week and the mother just couldn't be bothered. What has become of today's mothers? I love your look all together, the shorts are so cute!! Already thinking bout what to wear for the iFabbo conference...will you make a post on your outfit ideas? Okay, forgive my rant here.... But WTH is wrong with these people?! Why weren't these kids in carts? Why would people possibly think it is cute to let their kid wear only underwear in a store? An adult would be arrested for indecent exposure! I hate when you're out, and you see a parent who is wearing a coat and pants and a hat, and they are carrying a baby who has on a onsie and no shoes or socks. Um, if you're cold, your kid is too! Idiots I tell ya! And while we are on the subject, how about those commercials where a kid gets spaghetti all over their head, or spills an entire carton of milk, and the mom smiles and cleans it up, like "awww... isn't that disgusting mess cute?". Ugh! Okay, thats enough of that. Sorry! Such a fun sweatshirt, and I LOVE your boots! Great look Cheryl! Ha ha your post made me laugh yes this has been talked about before it's called the bratty bunch many people today just do not teach their kids good manners. But great look though love the boots! I'm loving that quirky sweater! It's fun and chic! Can't wait to see how you style it this Fall! Ohmigosh those booties are awesome! I cannot believe that they're from Charlotte Russe. Thank you for sharing your fashion verdict with me on my last post. Love this outfit Cheryl, such a cute jumper. And those shorts, love! Congrats on the Jason Wu scores! It was nice that people were so civil about it as well. Ahh kids are something else aren't they? We'll be waiting for the next set of crazy kid stories. looking great and hot! I got a new sweater too with teddy bears! Those cut out booties are fabulous!! and I share your feelings about the kids. unacceptable.